TRUE Crafted Catering now provides a unique catering service to the people of the greater Charlotte, North Carolina area. Our vintage mobile kitchens allow us to cater at any venue with any type of menu. Our first truck, “Big Red”, a beautifully restored 1947 Ford farm truck, has been catering events throughout the greater Charlotte area since 2013. The response to these unique events has been so positive that we decided to add a second truck to enable us to serve larger social and corporate events. In April of 2017, we added “Big Mack”, a 1956 fully restored Mack Farm Truck to the fleet. Both of our trucks are self-sufficient, extremely versatile catering vehicles that enable us to prepare and serve any type of cuisine. The passenger’s side is the business side of the truck. Hidden behind the fabric paneling is a wood-fired pizza oven, a 42″ grill, two refrigerators, a freezer and a three compartment sink with hot and cold running water. A cabinet below the pizza oven holds our firewood. Imported from Italy, our handcrafted Valoriani pizza oven reaches up to 1000 degrees, and the pies cook in three minutes. The Sunbrella awnings on both sides of the truck open to cover the work area and provide protection from the elements. The truck is designed to be completely self-sufficient. Along with it’s own water supply, it uses a gas generator to power the refrigeration and the rest of the electrical system while in remote locations or driving. At the event site, the truck is plugged into a regular household outlet when possible. We pull up to the party location, fire up the wood-fired oven and grill, and begin making pizzas. Unlike most catering, where planning a menu means trying to take everyone’s different food preferences into account, with pizza we are able to use a selection of popular toppings to create a diverse buffet of pizzas that appeal to almost everyone. The format is flexible and low-maintenance, simple and easy to operate, and most importantly fun for guests and hosts. We are fully equipped to handle events of all sizes, from intimate rehearsal dinners to large corporate staff dinners and lunches. The beauty of our trucks is that they allow us to pull up to your venue and produce a vast array of food without ever having to enter your location or rely on your facility for equipment. The wood burning ovens allow us to produce anything from Artisan Pizzas to whole roasted Filet Mignon or Rack of Lamb. The trucks’ versatility enables us to expand our offerings to include grilled steaks, chicken, pork, hamburgers, hot dogs, pastas and sautéed and baked entrees and appetizers. 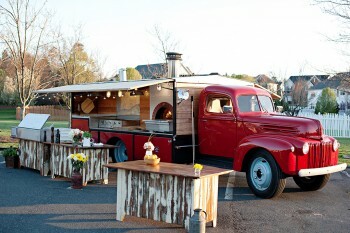 For more information about TRUE Crafted Catering, please visit www.truecraftedcatering.com.